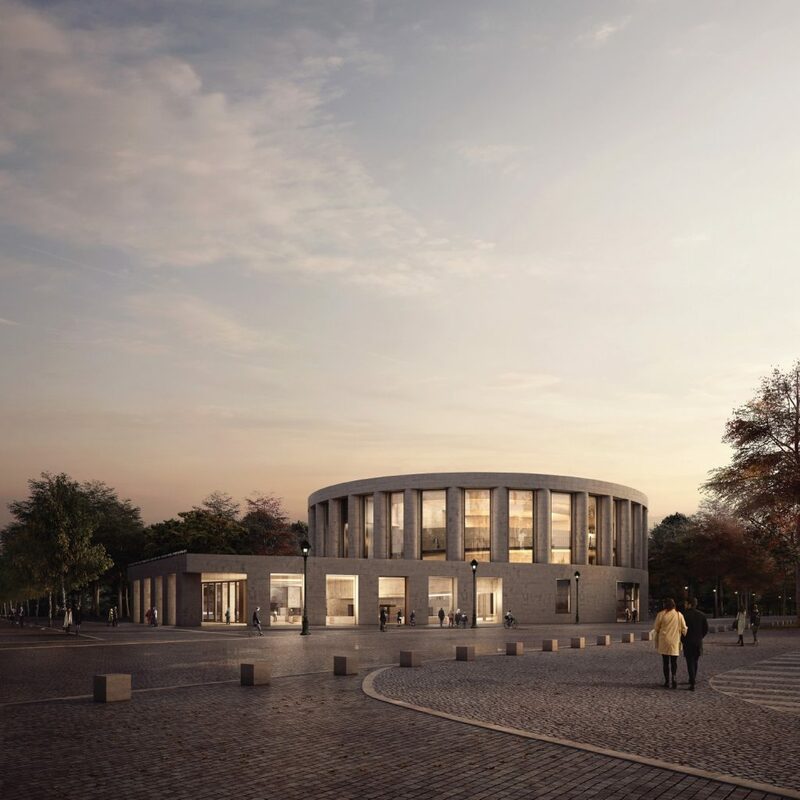 The building is conceived as a contemporary pavilion set within a clearing of trees in the parkscape of the Tiergarten. The concept of a pavilion in the landscape reconnects the building’s scale and setting but also follows a long tradition of urban design in Berlin originally conceived by K F Schinkel in his urban design philosophy of creating a landscape punctuated by singular architectural monuments as opposed to the principal 19th Century urban design philosophy of unifying spatial design. The building form is composed of two main elements: a rotunda and portico. 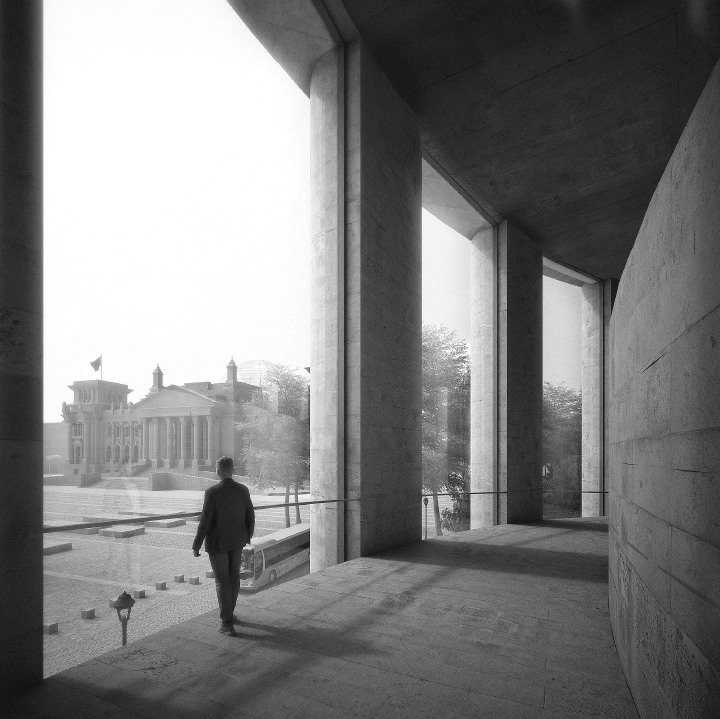 Formed entirely from the Silesian Sandstone of the Reichstag, the three storey columned rotunda stands on a deep base that follows a circular form before straightening into a single storey portico entrance aligned to the allees that bound the site. 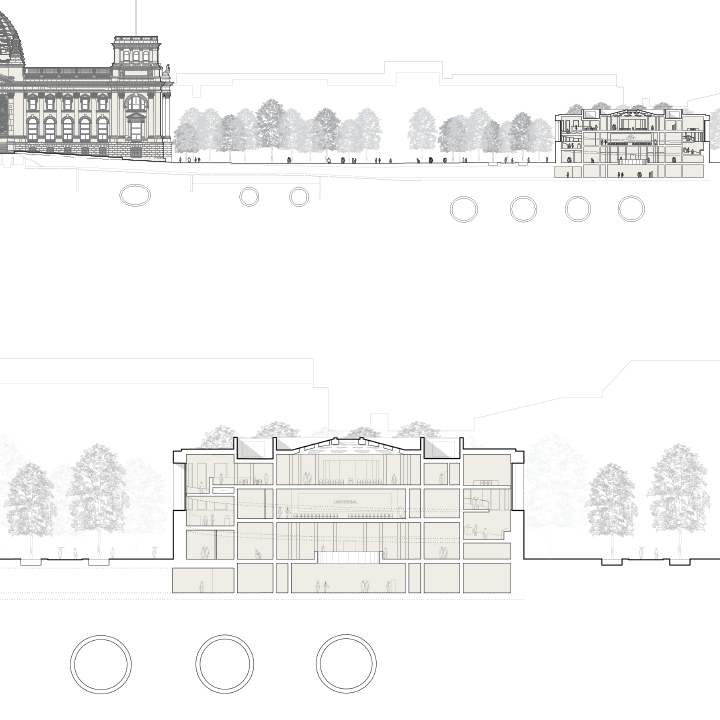 As such the entrance portico addresses and opens onto all three routes through the park, with its entrance facing onto their intersection and the north west elevation, parallel to Simson-weg, angled to face the Reichstag. The portico provides a sheltered and secure portal into the base of the rotunda. 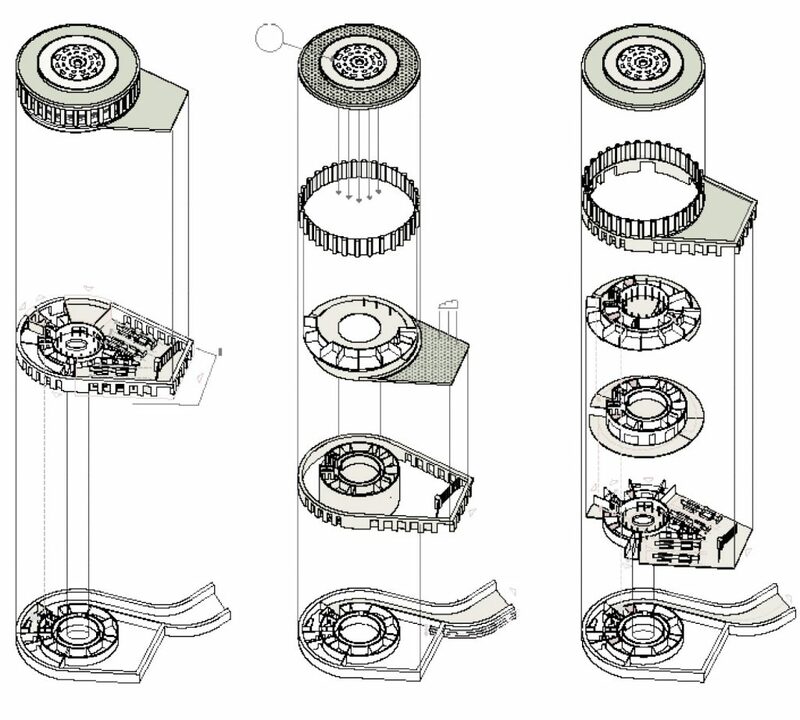 From here, emerging from the base and visible through the columns of the rotunda, a rising circular path provides the principal circulation, information and exhibition space whilst providing views out to the landscape and context beyond as it climbs around the walls of the building’s circular inner core housing the cinema. 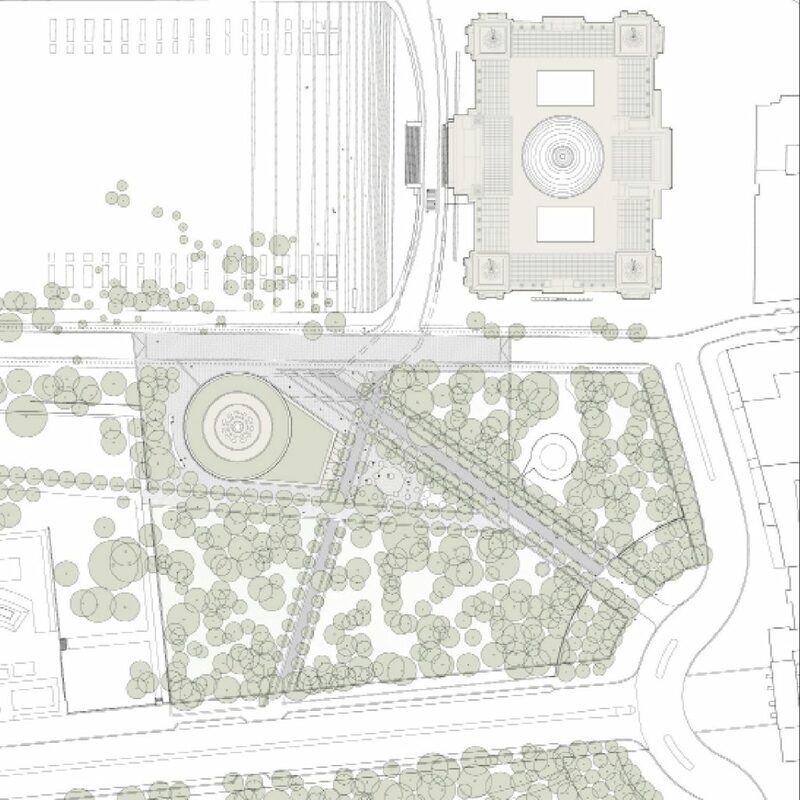 The path arrives at the top of the building at the door to the inner core’s plenary forum and ends at the restaurant which wraps around the rotunda to offer a place to eat, relax and enjoy views over Platz de Republik and the Reichstag beyond.